Allen Venteicher has owned Massena Livestock Sales for 25 years. Allen was born and raised in Iowa, and raised his own family in southwest Iowa. Mark, who is Allen's son, became Al's partner nearly 20 years ago. Mark and his family live on a farm north of Massena. He is the auctioneer at all the livestock sales. 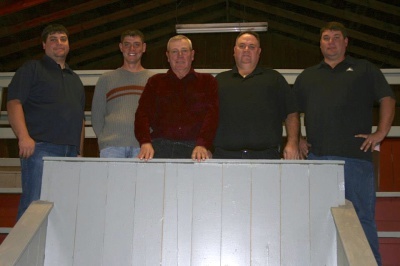 Mark & Al strive to make the local cattleman and farmer successful. It is their goal to get the best price for the livestock in our area. Allen and Mark work hard to help the seller make the right decisions and find the right buyer for the livestock. They have created a very competitive market in the area, to make the livestock bring the highest price possible. 1. We have lived in Iowa all our lives, we know the area and the people. 2. We want to help our local farmers and cattlemen to do what is best. 3. Our customers come back year after year. 4. We are family owned and operated.